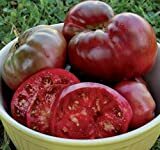 You'll find popular, exotic and heirloom tomatoes seeds for sale - red, yellow, even black and white. I'm a farm kid. My father was 11th generation New England Yankee. My mother's family got here from Italy in 1910. But those differences aside, both my grandfathers were farmers. So every winter after the fields were cleared, the talk began about vegetable seeds - especially tomato varieties and their seeds. 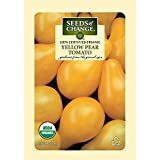 What tomatoes from seeds would we plant in the spring? Both families lived within earshot of each other, so the uncles (all 10 of them) on both sides of the family used to hang out in our living room reading seed catalogs and debating the merits of various tomato types. 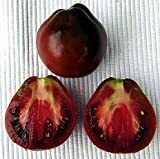 The common wisdom was that we needed the traditional red tomato seeds for salads, sandwiches and making tomato sauce. Then we needed yellow tomato seeds that were low-acid. There are some people who can't eat seeds because of digestive illnesses so we always tried to have a few seedless tomato varieties. Then the uncles always got curious about the new brands and we always had to have a packet or two of new of the new tomato varieties. Those didn't sell that well but the uncles really wanted them! Well I don't farm for a living any more, but I do have a garden and I still use that same philosophy in planning the tomato patch. Beefsteak tomatoes are huge (weigh a pound or two) and have lots of juicy flesh with a mild flavor. These are the tomatoes that you use to make your BLT sandwich. You can also mix them with mozzarella cheese and drizzle with olive oil. But because they're so juicy, they aren't good for cooking. Cherry tomatoes are part of the Mini Tomato category which also includes grape tomatoes. They are really sweet and are perfect in salads and even sauces. However if you cook them too long the seeds can get bitter. Roma tomatoes are also called plum tomatoes. These are the tomatoes that you should make you're spaghetti sauce with! They have a rich flavor and not many seeds. Generally yellow tomatoes mean low-acid tomatoes. But there have been so many new tomato varieties coming to market lately, that you have to check and make sure that that is still the case. 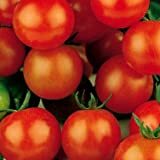 If you notice that a tomato seed is labeled as determinate that means that the tomato has a very short ripening period. You might get tomatoes for a few days or a week. An indeterminate tomato plant will keep growing and producing tomatoes until the first killing frost. When I see that I've got a determinate tomato variety, first I check out it's germination period and check it with our short Maine growing season. If I can, I stagger the seed planting by one week over three weeks. That way I don't end up with a bumper crop of say beefsteak tomatoes that I can't easily turn into sauce or salsa. 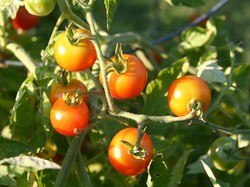 In fact, in addition to types of tomatoes you should account for early and late tomatoes. That way you have tomatoes all summer long. One of my experiments this year's tomato garden will be the Plum Lemon tomato on the bottom. It is supposed to be a mild tomato with meaty flesh - perfect for vegetable platters and salads. It's indeterminate, so there'll be lots to share with curious fellow gardeners. And of course they'll share their experiments with me. Last year's tomato experiments included the Black Sea Man heirloom tomato. It was delicious with a slightly salty taste. In spite of being a determinate tomato variety it did produce many tomatoes. BUT one of the reasons I (and many others) bought it was the unique color. Now this really shouldn't matter because we got a tomato that tasted great and grew well. But you know when you're expecting bright pink and black and it comes out well rather ordinary, it's a litte of a disappointement. But I am growing it again this year. Not only is there a devil of a genetic time to get a pure white or pure black. But I do believe that the soil and temperatures effect everything in a plant, inlcuding it's taste and color. So I'll often give a tomato plant (or tulip) a second chance. I've seen neighbors grow the exact same beefsteak tomato as I do and get a different level of sweetness. When this happens compare soil preparation techniques. That's why I grow a lot of tomatoes and vegetables in general. So if one's a disapointment, then I've got lots of others to enjoy! I like to try growing exotic types. Had some success and always amazed at the varieties. Weather stations for the home allow you to monitor cold spots in your pipes that often freeze and even to keep an eye on your garden plants from the comfort of your home! Easily get an accurate measurement of how much snow or rain your garden or property received with a home rain gauge.